Abbasi says Pakistan-US ties should not be ‘Afghan-centric’. NEW YORK: Prime Minister Shahid Khaqan Abbasi on Thursday raised the Kashmir issue with UN Secretary General Antonio Guterres and handed him a dossier about human rights violations in occupied Jammu and Kashmir. The prime minister urged the UN secretary general to appoint a special envoy for Kashmir, saying that it was necessary because India had closed all doors for any dialogue. He also called for expanding the UN’s Military Observers Group for India and Pakistan (Unmogip). The prime minister briefed the UN secretary general about ceasefire violations by Indian forces on the Line of Control. He told the UN chief there had been around 600 violations this year alone. He pointed out that only on Thursday, four people were martyred by Indian firing. Abbasi and Guterres also discussed the situation in Afghanistan and agreed on the need for a negotiated settlement to bring lasting peace in war-torn country. The UN secretary general said he had himself witnessed Pakistan’s counter-terrorism operations and that he was a great admirer of Pakistan’s efforts in this regard. He also admired Pakistan’s democratic consolidation. Guterres recalled his meetings with former Prime Minister Nawaz Sharif. He also conveyed the gratitude of the United Nations for Pakistan in its peacekeeping efforts. Abbasi is in New York to attend the UN General Assembly session. On Wednesday he met several world leaders, including US President Donald Trump and Vice President Mike Pence, and attend discussion events on Wednesday. Speaking at various events, Abbasi said Pakistan does not want its relations with the United States to be Afghan-centric, and called for understanding the sacrifices the country has rendered to make the world a safer place to live in. “We do not want these to be Afghan-centric,” the prime minister said, while responding to a question about the country’s relations with the US at the prestigious Council for Foreign Relations (CFR). “Pakistan wants to move forward and remain engaged with the United States,” he added. Abbasi on Wednesday had his first ever high-level contact with the US leadership, following the blunt allegations against Pakistan by President Trump in his announcement of the new strategy on Afghanistan and South Asia. Later, he also had a brief meeting with Trump at a reception hosted for the world leaders. “President Trump was very positive about Pakistan,” Abbasi told the American businessmen and investors at a luncheon meeting with the US-Pakistan Business Council. He added he told the US president that Pakistan is committed to fighting terrorism in all its forms and manifestations. At the CFR event, which was broadcast live on the internet on Wednesday, Abbasi said Pakistan sincerely believes in defeating terrorism. “The world needs to understand that it [Pakistan] is the only country that is fighting terror on the ground,” he added. He said Pakistan did not bill the US for the use of its air and land routes, as it sincerely believes in defeating terrorism. He added very little payments had been made to Pakistan in terms of military assistance. He, however, appreciated the USAID for undertaking several projects in health and social sectors. 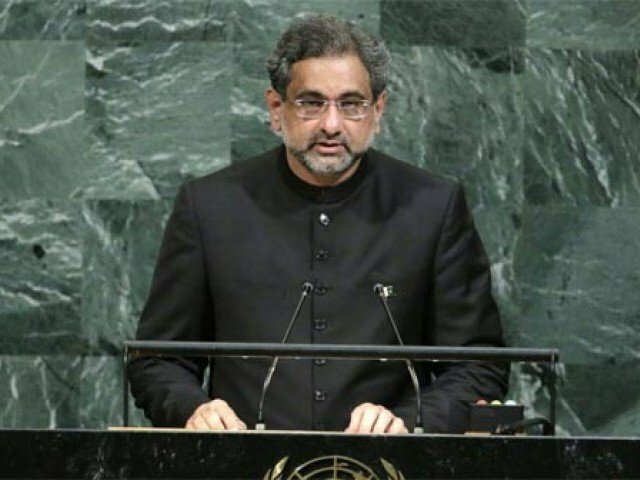 When asked if Pakistan would allow US bases in Pakistan, Abbasi said: “I believe there is no need for any bases anymore.” He called on all the nations to respect the sovereignty of others and stressed that Pakistan could not condone drone strikes to any targets on its soil. Responding to other questions, Abbasi said Pakistan has a fully secure, reliable and robust nuclear command and control system under a full civilian oversight, adding that the country, as a responsible nuclear state, has the track record of ensuring its nuclear assets do not fall into wrong hands. “Our command and control system is as secure as anyone else has,” he told the participants. “Let there be no doubt about that,” he added. Periodic meetings, he went on to say, are held and a regular review is undertaken to ensure the safety and security of the nuclear assets. Abbasi said Pakistan only has short-range nuclear weapons to counter any threat from India. About the country’s civilian nuclear power programme, the prime minister said the government wanted to diversify and utilise all resources to meet the energy needs. The PM termed cross-border incursions from Afghanistan a very serious matter and pointed out that on the Afghan side of the border, not a single soldier is posted for almost a 350km-long stretch. “These huge tracts of land are a haven for drug smugglers and terrorists,” he said. He said Pakistan has proposed to Kabul joint patrols on the border. “Without proper border management, the issue of cross-border terrorism would be hard to control and that was why Pakistan had started fencing to protect its territory,” he added. Prime Minister Abbasi dismissed the Afghan allegations of safe havens of terrorists inside Pakistan. He said Pakistan has an abiding interest in peace in its neighbourhood. He added Taliban are Afghan nationals and “it is for the Afghans to find a way how to deal with them”. Responding to another question, he said India already has trade with Afghanistan, but added: “Pakistan does not foresee any political or military role of India in Afghanistan.” He said Pakistan desires equal treatment by the US towards it and India. About the case of Dr Shakeel Afridi, who was arrested after the US raid on a hideout to take out Osama bin Laden, he said he is in detention and under trial for violating laws of the land. He said it was his duty to share with Pakistani security forces if he had some information. In an interview to the New York Times, Prime Minister Abbasi said Pakistan is an active partner in the war on terrorism and has uprooted all sanctuaries used by militants in the rugged region along the border with Afghanistan. The PM said Pakistan’s military forces have uprooted all sanctuaries used by terrorists along the border with Afghanistan. Prime Minister Shahid Khaqan Abbasi on Thursday raised the Kashmir issue with UN Secretary General Antonio Guterres and handed him a dossier about human rights violations in occupied Jammu and Kashmir.